On Saturday, May 21, 2011, the Santee Sportsplex USA, in partnership with SoccerNation.com and supported by several local businesses, honored members of the U.S. military with the first annual Armed Services Appreciation Tournament. 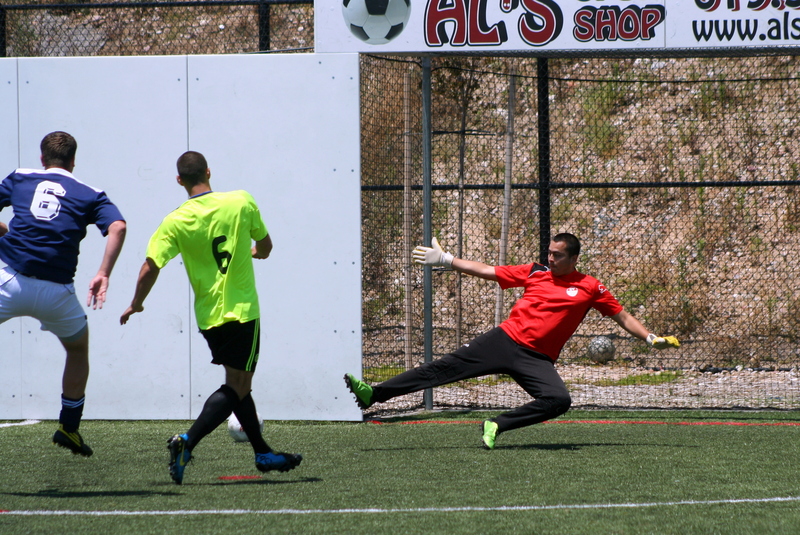 Ten teams, seven with military members, competed in the indoor soccer tournament held on the facility’s two indoor/arena fields. The day also included a noontime ceremony honoring the military. The day began with the first of three preliminary rounds of soccer. 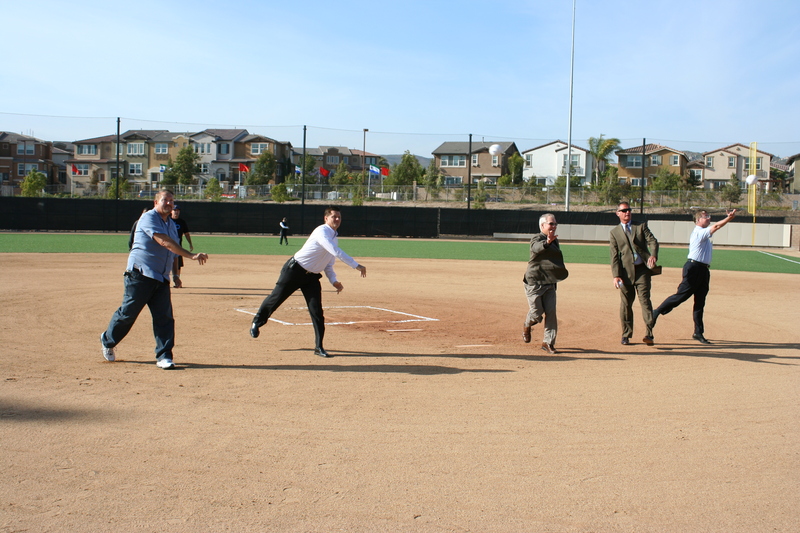 Teams were encouraged to include members of the military, which several did. Among those participating were the Leathernecks, a team made up in part of current and former U.S. Marines stationed at MCAS Miramar, primarily in Marine Aviation Logistic Squadron (MALS) 11. Another heavily-military group was NMCSD FC (Naval Medical Center San Diego) with active-duty and non-military personnel from Balboa Hospital. A third team with a sizeable military contingent was Not in Jordan’s House, which included Navy and Army Reserve members and one graphic designer. 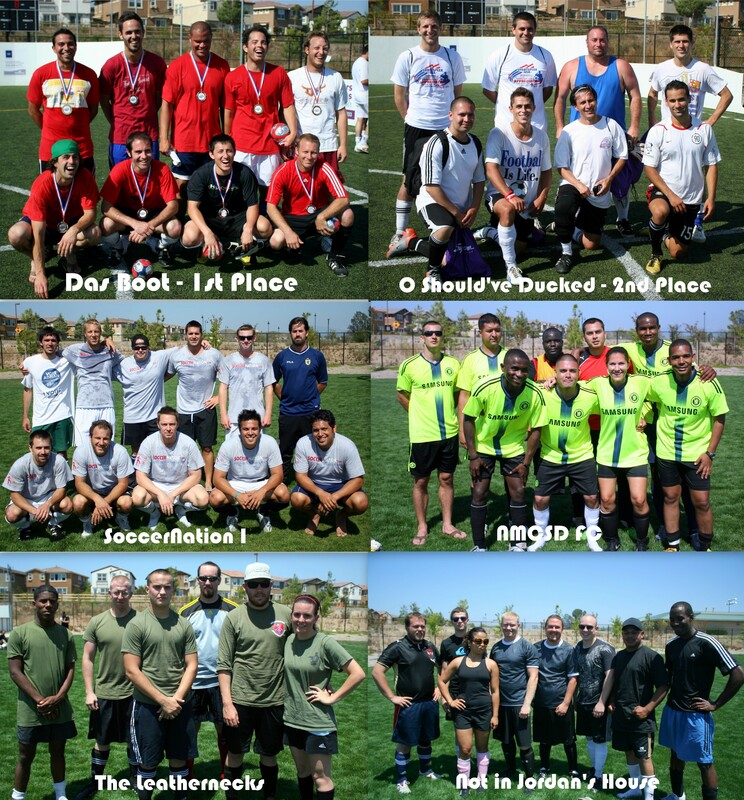 The two strongest teams going into the playoffs were NMCSD FC and Das Boot, a team made up of soccer players and enthusiasts that usually play at the Poway Sportplex USA facility. Both teams went undefeated through the three preliminary rounds and finished 1-2 based on points and goals. Joining the leaders in the playoffs were SoccerNation I, sponsored by the website SoccerNation.com, and O Should’ve Ducked. The latter team, whose name was inspired by recent world events (the “O” stands for Osama), was in effect a last-minute creation and included three members of the San Diego Flash professional team (National Premiere Soccer League). Number two seed Das Boot, which had just finished its third preliminary game moments before the playoffs began, was able to defeat third seed SoccerNation I in their game. The big surprise was fourth seed O Should’ve Ducked which defeated first seed NMCSD FC. In the championship game Das Boot took a 2-0 lead at the half and went on to beat O Should’ve Ducked 5-1. 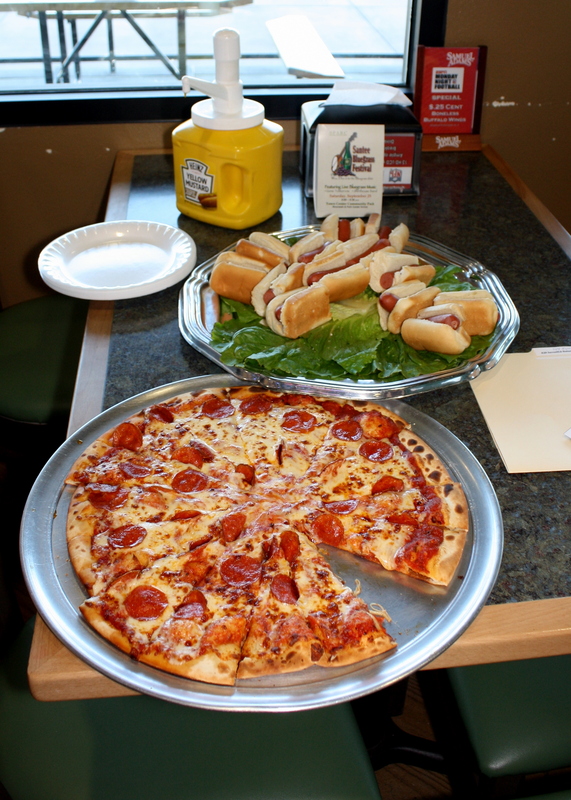 The winners received a $100 voucher for a team dinner at Buca di Beppo, medals, and mini soccer balls. 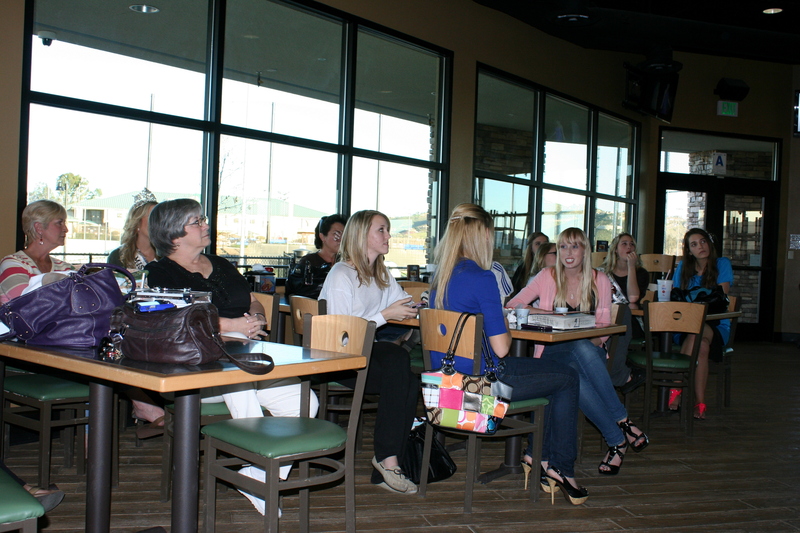 The second place team received a team wings dinner at Hooters and gift bags from Sycuan Casino. The day was not all soccer. 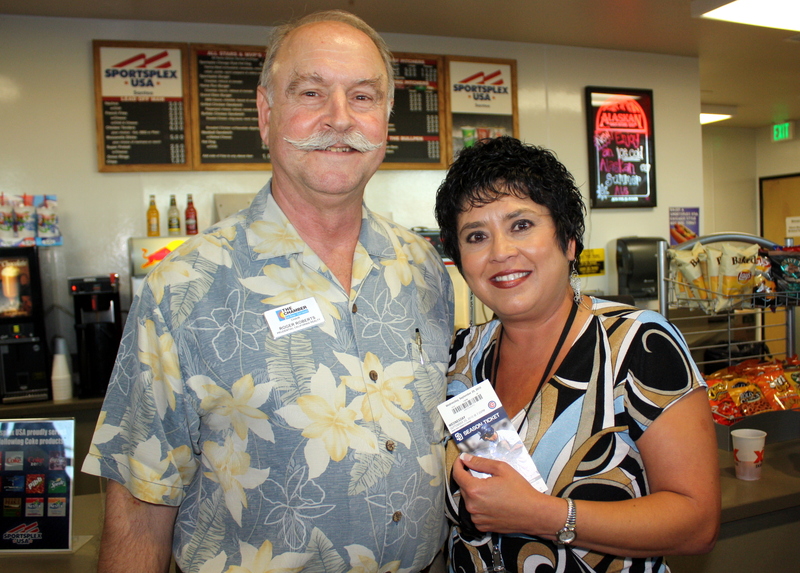 At noon Santee Mayor Randy Voepel led a ceremony honoring members of the military. 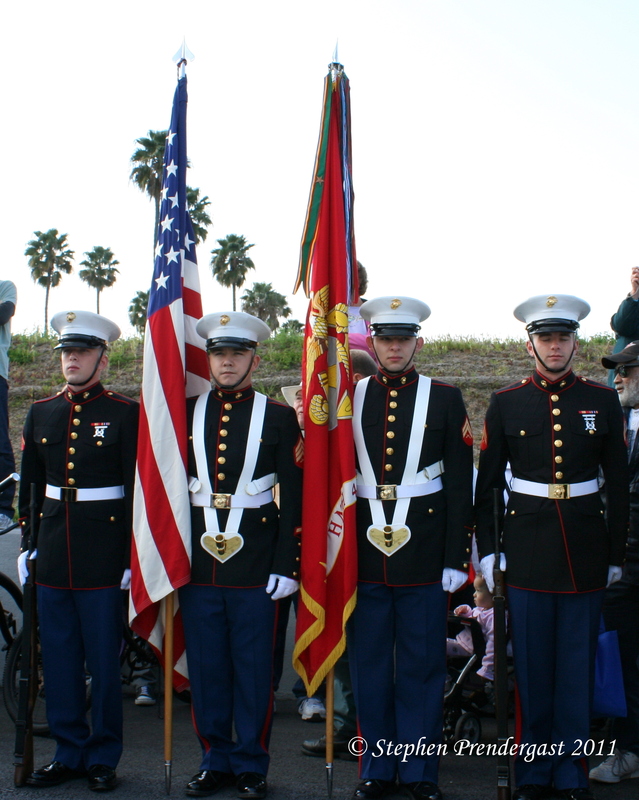 Santee is a particularly appropriate city to hold this type of ceremony because it is the only city in San Diego County to have adopted military units. Not long after 9/11, then-Congressman Duncan Hunter (Sr.) approached cities in the county with the idea of adopting military units to show their support during the War on Terrorism. Because he “didn’t want to be a slouch,” Mayor Voepel encouraged the City Council to adopt not one but two units: Heavy Marine Helicopter Squadron 462, the “Heavy Haulers,” from MCAS Miramar and the 2nd Battalion 1st Regiment, “The Professionals,” stationed at Camp Pendleton. Also on hand for the ceremony were Miss Santee Maria Maes, Miss Santee Teen Savannah Keener, and special military guests. 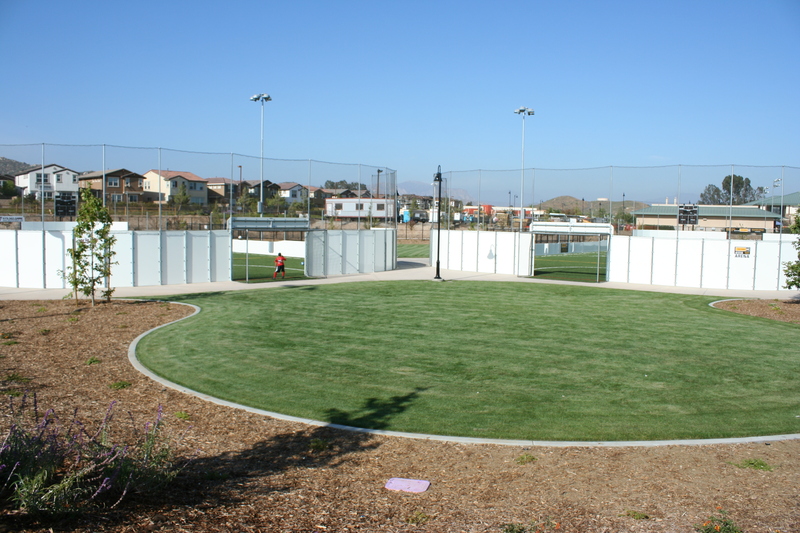 To honor our military, Sportsplex USA in Santee will host an Armed Services Appreciation Tournament for indoor/arena soccer teams on Saturday, May 21, beginning at 10:00 a.m. The tournament features ten teams that will play three qualifying rounds each, with the top teams advancing to the playoff rounds. At noon there will be an appreciation ceremony featuring Santee Mayor Randy Voepel and several members of the military. The City of Santee is an appropriate place to hold a military appreciation event, as it is the only city in the county to have adopted military units. Not long after 9/11, then-Congressman DuncanHunter (Sr.) approached city leaders in San Diego County with the idea of adopting military units as a show of support. For Mayor Voepel, this was a “no brainer.” As a former U.S. Marine and a Vietnam Veteran, Voepel has been active in supporting the military on his own time and did not want Santeeto seem like it was “slacking off” in its duty. So, with his support, the city adopted two USMC units: the 2nd Battalion 1st Regiment (“The Professionals”) stationed at Camp Pendelton and HMH 462 (“Heavy Haulers”) helicopter squadron from MCAS Miramar. 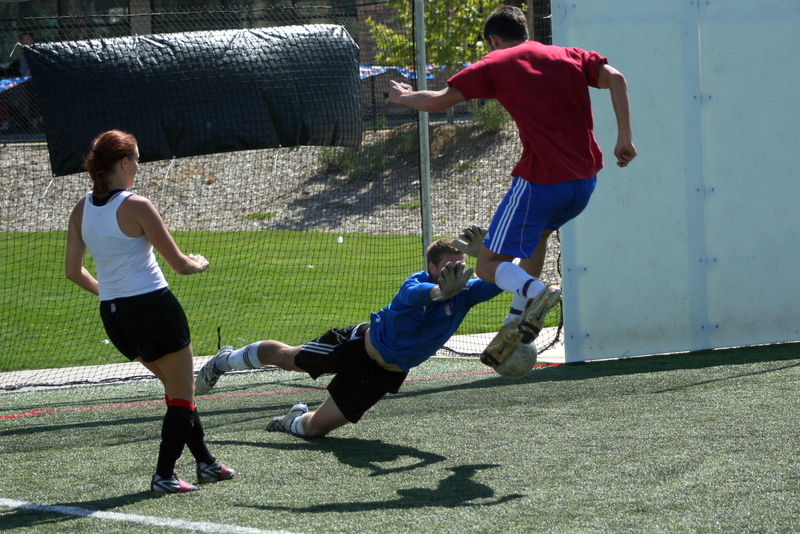 The tournament is presented by SportsplexUSAin conjunction with SoccerNation.com, a premier online soccer magazine focusing on Southern California club, college, and professional teams. San Diego Countyshowed itself to be one of the top soccer areas in the country during the World Cup, and it is home to thousands of youth and club players. Members of some of the local professional teams, including the Sockers, Flash, and Boca, will be on hand to share tips with players and fans. Entry to the Sportsplex USA complex for general public (over 18) is $2.50, but this includes a token for an equal value in drinks at the on-site restaurant. Military members are free with I.D. 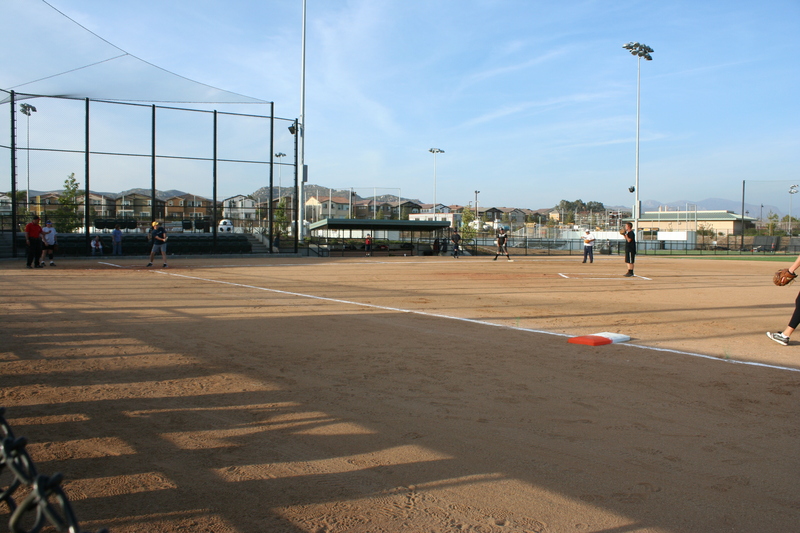 Sportsplex USA is located at 9951 Riverwalk Drive, just east of Rio Seco School and the adjoining ball fields. For more information on the event, visit the Sportsplex USA website. The annual Miss La Mesa-Miss Santee Pageants take place on Friday, March 4, at the Sunrise Community Church on N. Magnolia Ave. The Pageant is open to young women age 13-16 (Miss Teen) and 17-26 (Miss), with the focus on community service and leadership. There is no fee to enter and winners receive scholarship money raised from donors and the annual Fashion Rocks the East fundraising show. The competition includes a personal interview, evening gown, and on-stage question, but no swimwear. The women also compete in an essay writing contest. The winners become their city’s hostesses and representatives for the next year. Over the past two years the Miss Santee winners, Sierra Billock (2009) and Kimberly Swank (2010) have been outstanding representatives, ably aided by the Teen winners, Nicole Ehlke (2009) and Taylor Shelton (2010). Ms. Billock, in fact, was the originator of the Fashion Rocks the East show and continues to work along with the Pageant directors. The Miss and Miss Teen attend the annual Santee Street Fair and the new Santee Car Show, the Holiday Lighting Celebration, new business openings, and more. 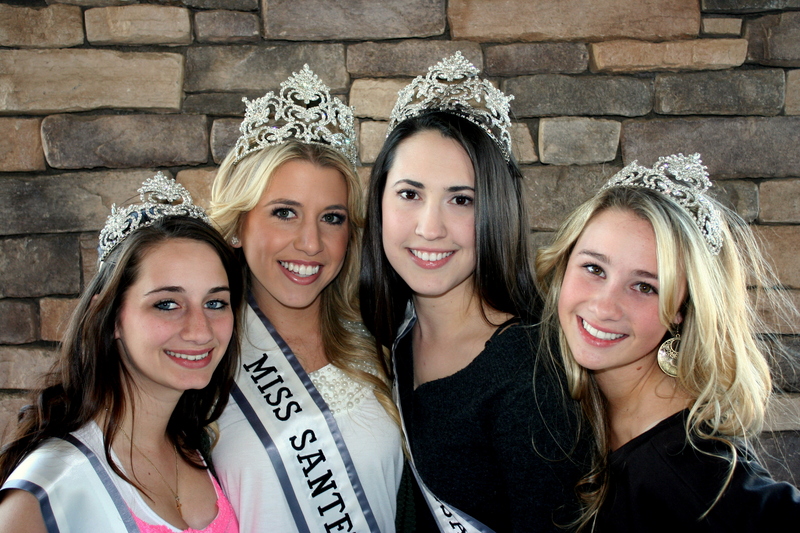 In addition, girls age 6-12 can become Santee Princesses and join the Queens and their courts at local events. If you or a young woman you know would be interested in either competing for Miss or Miss Teen Santee or La Mesa, there is still time to apply. The deadline is Sunday, February 20. You can get more information from the Santee or La Mesa Chambers of Commerce or from Pageant Director Alexandra Kuty (619-698-4163 or misssanteepageant@yahoo.com). 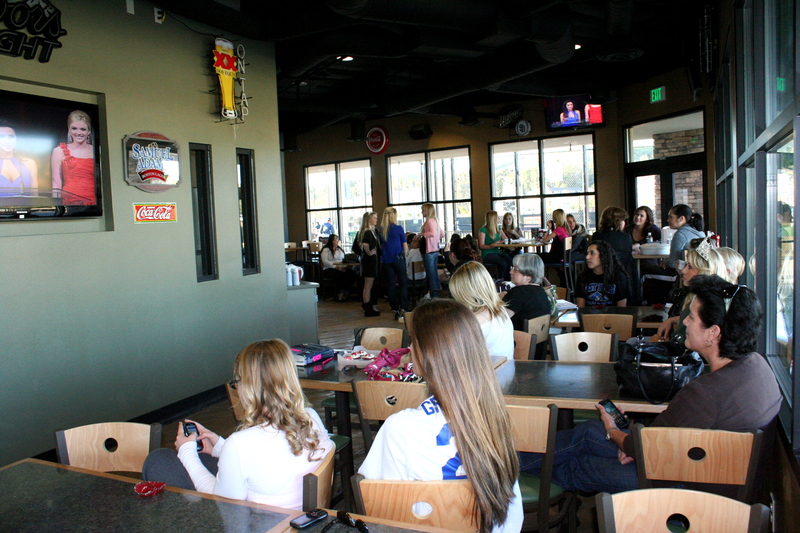 On Wednesday, February 9, the Pageants held a “movie night” where 2011 contestants could watch the video from the 2010 Pageant. This has become an annual event that gives new contestants an opportunity to see just what to expect. 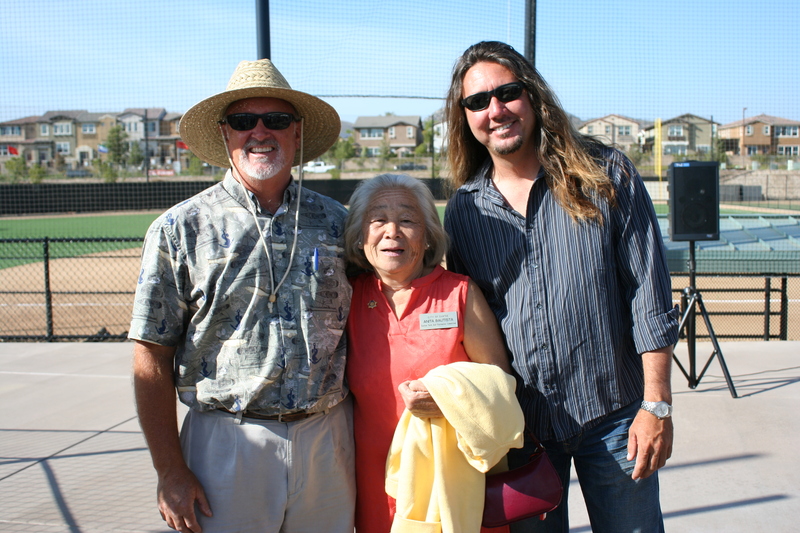 This year the event was held at the Santee Sportsplex USA. Below are some pictures from the day. 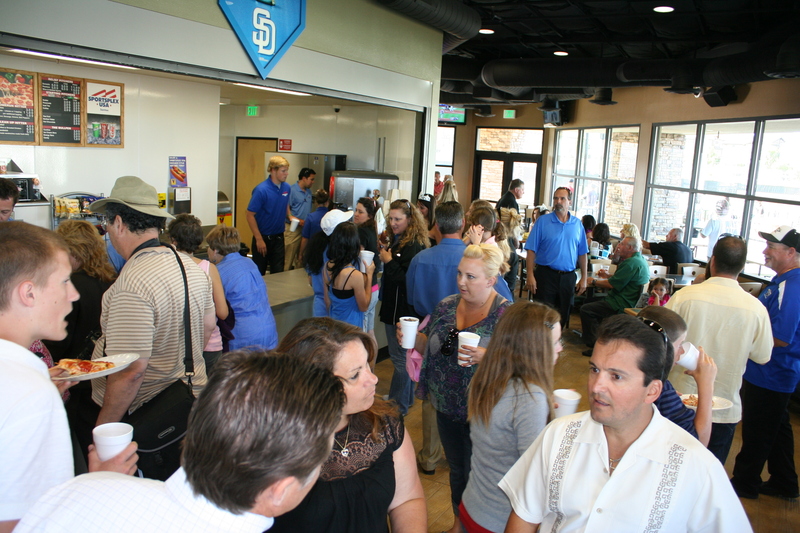 Around 100 businesspeople gathered at the Sportsplex USA facility in Santee’s Town Center Community Park on Wednesday, September 15, for a networking mixer. 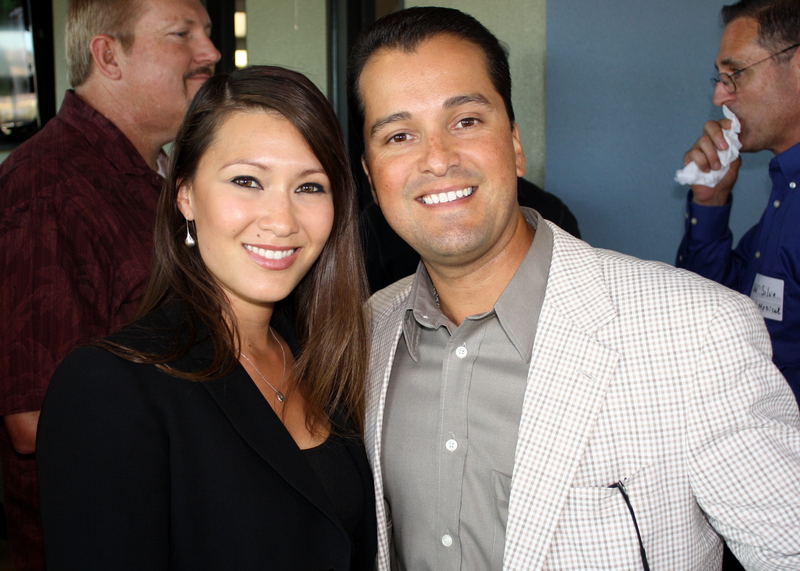 The event was sponsored by the Santee and East County Chambers of Commerce and drew guest from throughout San Diego County. 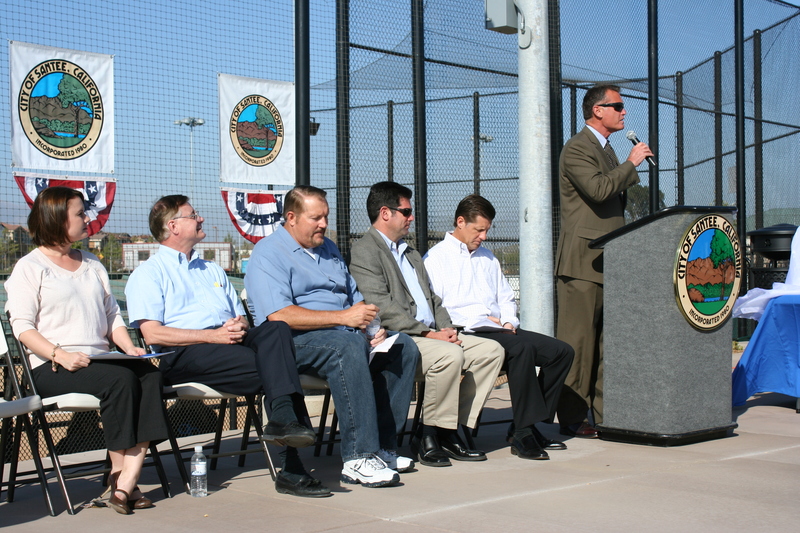 It was also an opportunity to showcase the very successful Sportsplex USA complex, which features fields for indoor/arena soccer and softball/baseball, batting cages, and a sports-themed play area for kids. 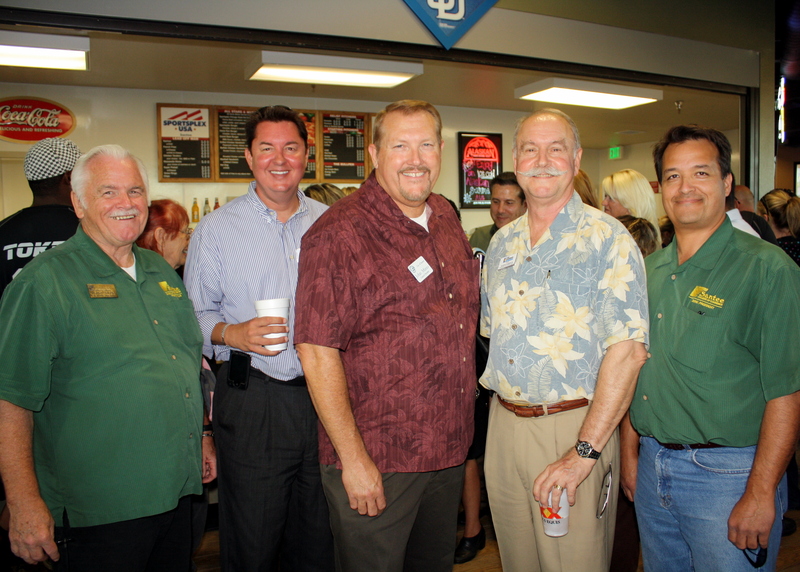 Board members of both Chambers of Commerce were there in force to greet regular members and guests. 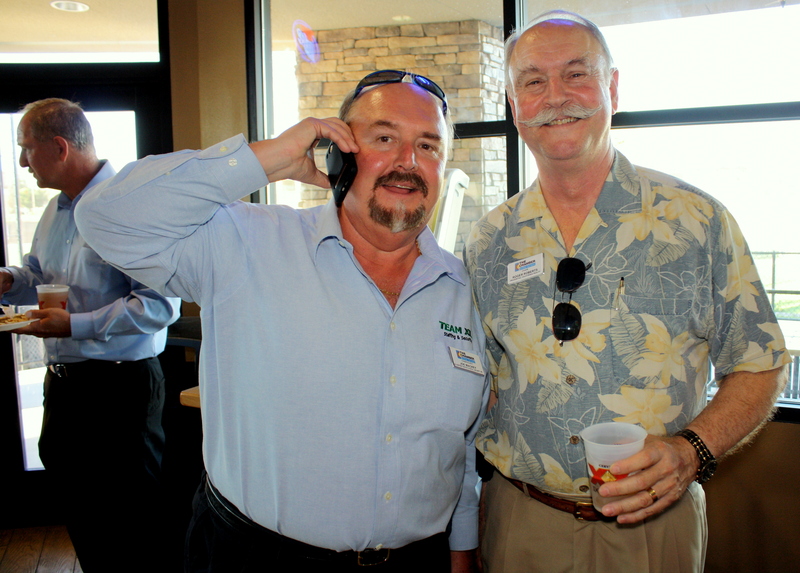 Many of the business owners attending had not had an opportunity to meet with those of other Chambers, so this was a chance to broaden their networks. 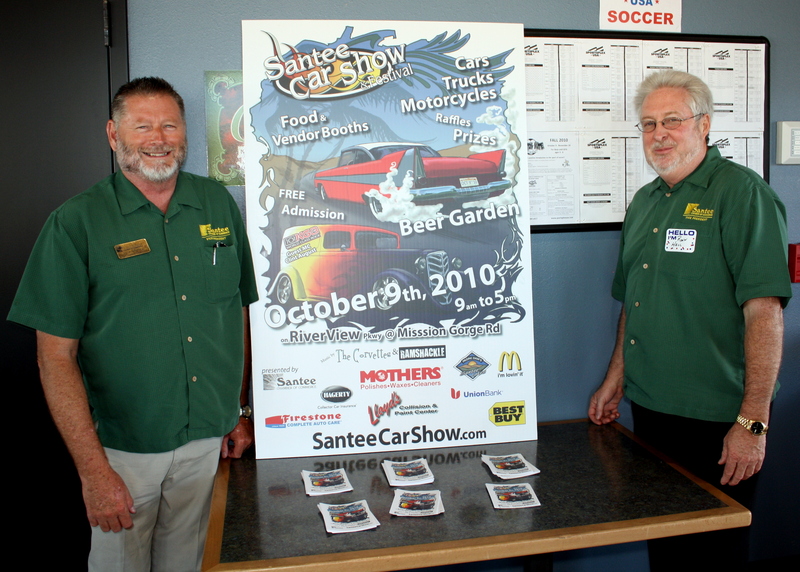 The Santee Chamber took the opportunity to promote the upcoming Santee Car Show in October and both Chambers talked up Passport to the Future, the East County’s largest business expo. This event takes place on Thursday, September 23, at the El Cajon Elks Lodge from 5:00-8:00 pm, and is sponsored by the East County, La Mesa, and Santee Chambers of Commerce. For more information on the event, visit the event website. 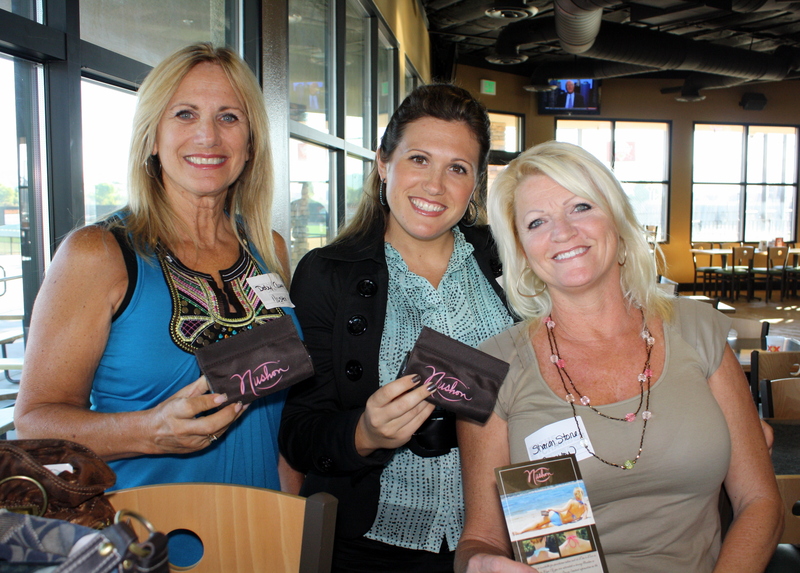 One of the newer businesses attending was Nushon, a Lakeside-based company that has patented a silicone cushion that protects a woman’s neck from bikini and other straps. The owners and creators, Deby and Deanna Cowan and Sharon Stone, developed the idea on a trip to Las Vegas, proof that not everything that happens there stays there. The original product was a simple clear tube split to fit over the strap, with an opening for the connection (bow, hook, etc.). have since added a variety of color choices. You can learn more at their website. 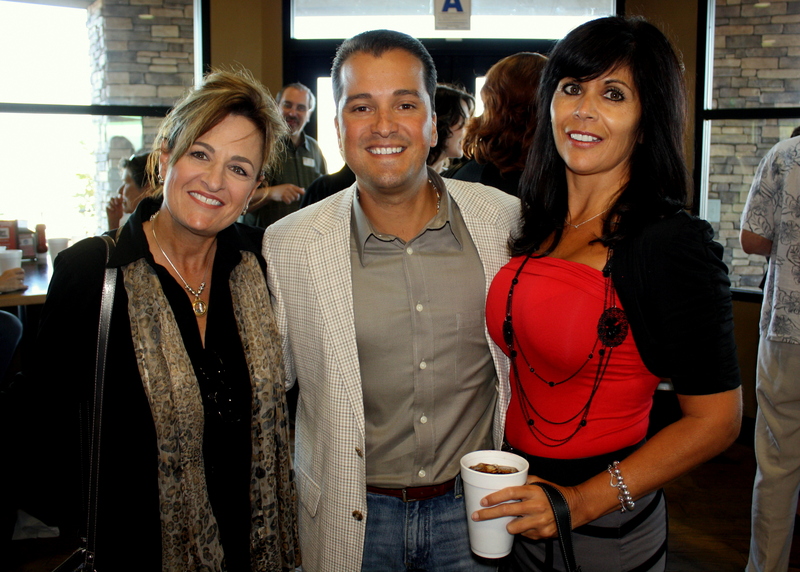 A highlight of the evening was a special fundraiser to support the East County Chamber. 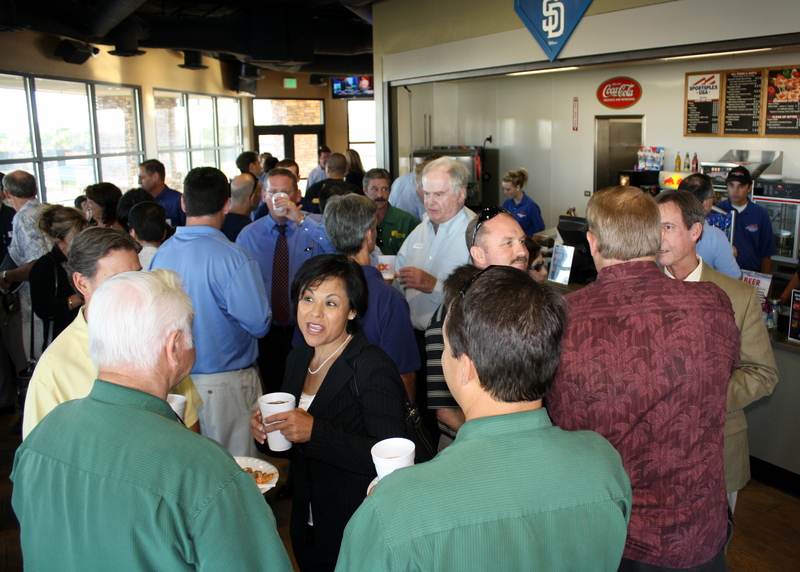 Two field level tickets to an upcoming Padre-Cubs game were auctioned off, with all proceeds going toward the Chamber’s activities. Rachel Lynch of Marriott Residence Inn was the lucky winner. 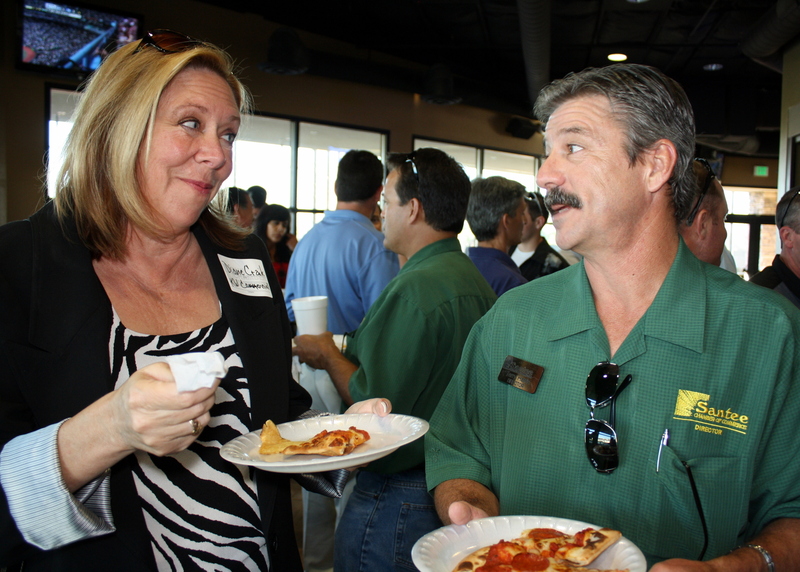 Enjoy a few more pictures from the Sportsplex USA Mixer.